The Holy Spirit—the Third Person of the Blessed Trinity who descended upon Mary and the apostles at the very first Pentecost—does not have a body. He’s a pure spirit, and pure spirits by definition are just that—purely spiritual beings. And yet, as Catholics, we say we believe that the Holy Spirit is still present with us. But how exactly do we know that? Think about it: When the Second Person of the Blessed Trinity came into this world it was easy to recognize his presence among us, since he had a human body! People could see Jesus with their eyes; they could reach out to him and take hold of his hand or touch his face. In other words, they could experience him in a direct manner with their senses. But the Holy Spirit has no body. He has no physical attributes. So how do we know he’s around? How do we know he’s here? The answer is: By his works! We know the Holy Spirit by his works, by what he does in us and in the world. Now some works of the Spirit are relatively easy to recognize. For example, have you ever known someone who’s had a radical conversion to Jesus Christ, and then remained strong in their faith? Hopefully you have! That type of deep and lasting conversion is definitely a work of the Holy Spirit. And it’s easy to see. It’s clearly evident. This text refers to a human being who says those words and truly means them! When a person of faith affirms the Lordship of Jesus Christ, it’s a work of the Spirit dwelling within him—a work which is easily recognized. Or how about the people who have turned themselves in to the police within the last few months, after going to see Mel Gibson’s movie, “The Passion of the Christ”? Since one of the roles of the Holy Spirit is to convict us of our sins, I would say that the repentance of these criminals is the result of the Spirit working in their consciences, moving them to take responsibility for their evil actions. These are just some of the works of the Spirit which are fairly easy to see and comprehend. The grace of sincere prayer—which has its source in the Holy Spirit—is something we can easily take for granted, is it not? We normally don’t think twice about it. But it is a work of the Spirit nonetheless! These are all sacramental works of the Holy Spirit which are very familiar to us—so much so that we can easily take them for granted. There are also works of the Spirit which are attacked by those who oppose Christ and his truth. For example, as we heard a few weeks ago in a reading from Acts 13, when Paul and Barnabas preached the Gospel in Antioch by the power of the Holy Spirit, they were immediately run out of town! Do you recall that story? For this great work of the Spirit, they were attacked by worldly people who didn’t want to hear the message. Paul had similar experiences throughout his ministry as an apostle. In our own time, when the Church proclaims the full truth of Christ by the power of the Holy Spirit in matters of faith and morals, she is often attacked in the media and in the secular press. She’s sometimes even attacked by people who call themselves Catholic. And finally, there are some works of the Holy Spirit that are hard to recognize except in hindsight. Twenty years ago, for instance, the experts were saying that Soviet Communism was here to stay. But it wasn’t. And it all collapsed without a devastating nuclear war or some other terrible military conflict. In hindsight, I—and many others—believe it happened that way by the power of the Holy Spirit. The relatively peaceful collapse of the Soviet bloc was due to 70-plus years of persistent prayer and redemptive suffering, as inspired by the Spirit. That’s the work of the Spirit being recognized in hindsight. Why do I share these thoughts with you today concerning the works of the Spirit? It’s because the Holy Spirit tends to be the “forgotten” Person of the Blessed Trinity! Because he’s a pure spirit, because he doesn’t have a body, most Christians don’t speak about him very often, and some may never even give him a passing thought! And yet (as I hope I’ve made clear in my homily) this same wonderful—but ignored—Holy Spirit is at hard work every single day in the Church, in the world, and in our personal lives. 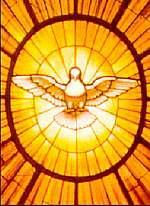 And so, may our common prayer on this Pentecost Sunday be: Thank you, Holy Spirit. Thank you for working so powerfully in the Church, in the world, and in my life. Make me more aware of your presence in the future, so that I will be more open—and more responsive—to your many works. This I ask through Christ, our Lord. Amen. Acts 14 and John 13: Don’t Leave the Message on Paper! 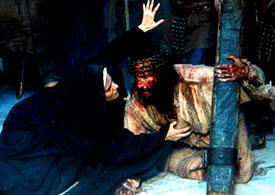 Jesus meets His Mother on the road to Calvary in The Passion of the Christ. Don’t leave the message on paper! These hardships include not only the ones that come from persecution (from being attacked for one’s faith); they also include what might be called the hardships of love. Let’s face it, loving another person often involves sacrifice and suffering—in a word, hardship! That’s something all good mothers know experientially, do they not? And so, on this Mother’s Day, we thank them for the many hardships of love they have endured—and in some cases are still enduring!—for us! Caring mothers often sacrifice what they want to do for the sake of what they know their children need to do. They endure hardships of fatigue, anxiety and sometimes even heartache in order to fulfill their vocation well. And they do so willingly! Loving mothers, in other words, do not leave the message of Acts 14 on paper! They live it. And how exactly did Jesus love us? He humbled himself, first of all, by stepping down from his heavenly throne and being born into this sinful world. And then he subjected himself to the most hideous death imaginable—all out of love for you and for me! He sacrificed his life, that our lives might be saved! Obviously, there’s a connection between our first reading from Acts 14 and this Gospel. One concerns the hardships of love; the other expresses the true meaning of love. But there’s also a connection between this Gospel passage and today’s second reading—a contemporary connection which might not be so obvious to us. Have you heard that line recently? I know some of you have. Jesus Christ renewed the human race—he made all things new and reconciled us to God the Father—by his loving sacrifice on the Cross. Real love is not the hedonistic, counterfeit love which permeates the culture we live in. That “love” leads to broken marriages and broken families—among other things! Real love is a participation in the self-sacrificial love of Jesus Christ! It’s the kind of love that Mary always had in her heart: the love which united her so deeply to Jesus that she must have wanted to die with him at Calvary, as Gibson portrays it in his movie. Is it difficult? Of course it is! But it’s definitely not impossible. And it’s definitely worth the effort. Just ask Pamela Donahue of Needham, Massachusetts. About a year and a half ago, Pamela went to see her obstetrician at Newton-Wellesley Hospital, for what she thought would be a routine prenatal exam. It was not. During the checkup, her doctor discovered a very serious problem, which turned out to be an aortic aneurysm in her abdomen. It was 4 times larger than what is commonly seen. Because of the obvious danger to her life, she needed immediate surgery. Unfortunately—but predictably—some of the health care professionals assigned to her case advised her to abort the baby. They were concerned about the developmental damage or birth defects the child might experience as a result of the operation. But, to her great, credit Pamela said no; she would not take the easy way out. This woman knew the possibilities. She knew the child might end up severely handicapped; she knew that caring for such a child would require an incredible amount of patience, effort, and sacrifice from both her and her husband—as well as from her two other children. But she was willing to make the sacrifice. She was willing to endure the hardship if it had come her way; she was willing to love her baby as Jesus loved us. Consequently, I have every reason to believe that Hayley Elizabeth Donahue is now a very happy child, who will be experiencing her very first birthday party within the next few days, if she hasn’t already. And it’s all because her mom and dad didn’t leave the message of Acts 14 and John 13 on paper! It’s all because they made the challenging but rewarding decision to live it! By the power of the Eucharist we receive at this Mass, may we follow that example today—and whenever we hear or read a passage from the Sacred Scriptures. Tradition has it that St. Paul was martyred in Rome during the reign of the emperor Nero, sometime around 65 A.D. In the fourth century they built a basilica over his tomb on the Ostian Way—a basilica which some of you have probably visited, known as St. Paul’s Outside-the-Walls. But it would be a mistake to think of this saint’s martyrdom as a once-only event, because it wasn’t! Yes, he was killed for his faith at one specific moment in time in the mid-60’s, A.D., but the fact of the matter is St. Paul experienced many little “martyrdoms” throughout his life as a Christian. None of these resulted in his physical death, obviously, but all of them caused him great suffering. Today’s first reading provides a case in point. In that text from Acts 13 we were told that Paul, on his very first missionary journey, went with Barnabas to the city of Antioch. When they arrived, they were invited to speak at the local synagogue on the Sabbath. This was a great opportunity to share the Gospel and lead the Jews of that region to faith in Jesus, so the two gladly accepted the invitation. But, sadly, when they delivered their message, not everyone said “Amen” to it. In fact, some members of the congregation went so far as to verbally attack the two apostles right in the middle of the service! Now, as one who preaches the Gospel on a regular basis, I thank God that’s never happened to me—at least not yet! I’m sure there have been some unspoken bad thoughts about me from time to time among those in attendance at a given Mass. But at least those unkind thoughts have remained in people’s heads during the Liturgy! Paul and Barnabas were not so fortunate. And then, to make matters worse, the two men became victims of an organized persecution (probably started by some of those who had been at the synagogue service), and they were eventually booted out of town. Here, in just a few verses from Acts 13, we have recorded for us two of Paul’s mini-martyrdoms. If you’re interested, you can read about many others in his epistles and in the remainder of the Book of Acts. The point I’m trying to make in sharing this with you today is that martyrdom comes in many forms. The word martyr literally means “witness.” As Christians, we normally use the term to describe those men and women who gave the ultimate witness to Christ by shedding their blood for him; but there’s a broader sense of the term that should apply to all of us who claim to be followers of Jesus. By the very fact that we are baptized and confirmed, we are called to be martyrs for Christ; in other words, we are called to be living witnesses of his truth and love. No one—and I mean no one—is exempt from this summons. Now at this point, let me make a very important distinction: the distinction between being a martyr and having a “martyr complex.” If you have a martyr complex (and I sincerely hope you don’t), you are either wallowing in self-pity, or you mistakenly think that everyone’s out to get you. In either case, you have an emotional problem for which you may need professional help. To be a Christian martyr, on the other hand, means to willingly and lovingly embrace difficulties because of your personal commitment to Jesus Christ and your deep love for him. That’s different! That’s very different! 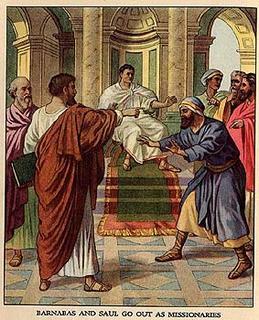 For St. Paul, the difficult experiences of his life and ministry provided lots of opportunities for daily martyrdom. And he took advantage of almost all of them, which is why he’s a saint today! Are we taking advantage of the opportunities the Lord is giving us to be martyrs of this type? To help you answer that question for yourself, let me share with you now some of the more common forms of “daily martyrdom.” Do they apply to you? First of all, there’s what I would call the martyrdom of doing the right thing when everyone around you is doing the wrong thing. Face it, we all like to “fit in”; we all want other people to like us. 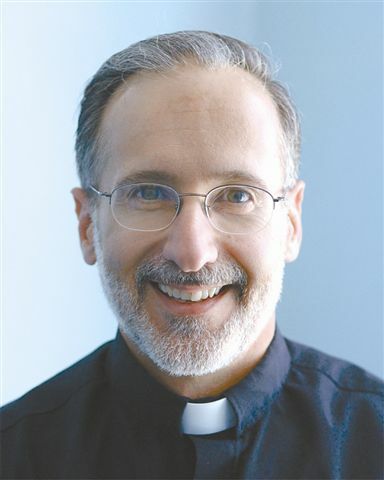 But there are times when we will only fit in and be liked if we violate the truths and moral norms of our Catholic faith: if, for example, we get drunk, or speak in a vulgar manner, or behave promiscuously. When these temptations come our way, do we resist, and accept the martyrdom that goes along with saying No? Or do we give in? Then there’s this one: the martyrdom of losing friends because you’re trying to take your faith seriously. If you radically change your life and make a personal decision to be faithful Jesus and his Church, some of your old “friends” (put friends there in quotes) will probably not want to be around you anymore. Are you willing to accept that type of martyrdom if and when it comes your way? There’s also the martyrdom of loneliness, which is the result of doing the right thing and losing old friends because of your commitment to Jesus. As Jeremiah and many of the prophets found out, walking in faithfulness to God can sometimes be a lonely road to travel, especially when most of the people around you are living by their own rules. There’s also what might be called the martyrdom of hurting your career for the sake of doing God’s will, for the sake of doing what’s right. Most of us have heard people say, “It’s a dog-eat-dog world! You’ve got to get them before they get you.” That line is often used as an excuse to justify cheating, cutting corners, and stabbing others in the back at work in order to get ahead. The bottom line is this: For the sake of career advancement, certain men and women are more than willing to do what they know is wrong. Are we? Or are we prepared to conduct ourselves as martyrs by sacrificing a certain amount of advancement for the sake of doing God’s will? By the way, do you know who, I would say, understands all these forms of martyrdom very well, based on his own recent experience? Mel Gibson. Think about it: Since he decided to make this incredible movie on the passion of Jesus, many of his old Hollywood “friends” have turned against him. They’ve called him everything from “a religious fanatic” to “an anti-Semite.” Those ongoing attacks must hurt him on the inside and cause some deep feelings of loneliness. And, as far as his acting is concerned, he was told early on that making a movie like this would be a “career killer.” People in the business warned him that he’d probably never star in another mainstream Hollywood film again! But, to his great credit, Mel has accepted his daily martyrdom in all these forms: the martyrdom of doing what’s right; the martyrdom of losing friends; the martyrdom of loneliness; the martyrdom of hurting a career for the sake of doing what you believe to be God’s will. Some of our politicians could definitely take a lesson in this regard. On that note, here’s one specifically for them: the martyrdom of losing some votes because you take a moral stand against abortion or some other social evil. Now don’t worry: Senators Reed, Kerry and Kennedy are in no danger of experiencing this type of martyrdom. But thank God some others are! And a final one which hopefully applies in some way to all of us: the martyrdom of service—especially difficult service. This type of martyrdom is sometimes experienced by parents who sacrifice themselves in order to have large families. It’s also experienced by those who give up their leisure time to help the sick or the elderly or the poor—because they know that’s what Jesus wants them to do! These are just a few of the many forms of daily martyrdom. Yes, they all have a cost; in fact, in some cases, they carry a very hefty price tag. But the good news is they also have their reward! And the reward comes not only after death; it also comes here on earth! Our readings today remind us of this important truth. Say what? These men had just been called every name in the book by their enemies and thrown out of the city of Antioch! And yet, they were filled with joy! That was the joy which came from serving God faithfully and doing the right thing. It was a joy which was rooted in their experience of daily martyrdom! But, of course, the ultimate reward of being a martyr for Christ is not found here on this earth. That’s clear from today’s second reading, from Revelation 7. There St. John has a vision of heaven, and in this vision he sees before him a huge crowd of people dressed in white robes and holding palm branches in their hands. We know for a fact that St. Paul and St. Barnabas are both in that crowd right now. May all of us someday join them!